For direct domestic hot water you should use a stainless steel coil exchanger or enameled tank-in-tank, which is installed usually on the upper part of the buffer tank. How quickly hot water temperature increasses to the required temperature depends mainly on heat-delivery surface (size) of coil exchanger. Buffer tanks equipped with a stainless steel coil are, in case of LMG, LVT and LSX types marked as -st.steel e.g. LMG 1000 d790 2V-St.steel or marked -2st.steel, which means both coils are made from stainless steel. On the other hand the LMT type buffer tanks are always equipped with a stainless steel coil which is marked as DN32, having 6.3 sqm heat-delivery surface or N825 with 8.25 sqm heat-delivery surface. They can be installed also with enamelled "tank-in-tank" Z180l, a 180 litres module. 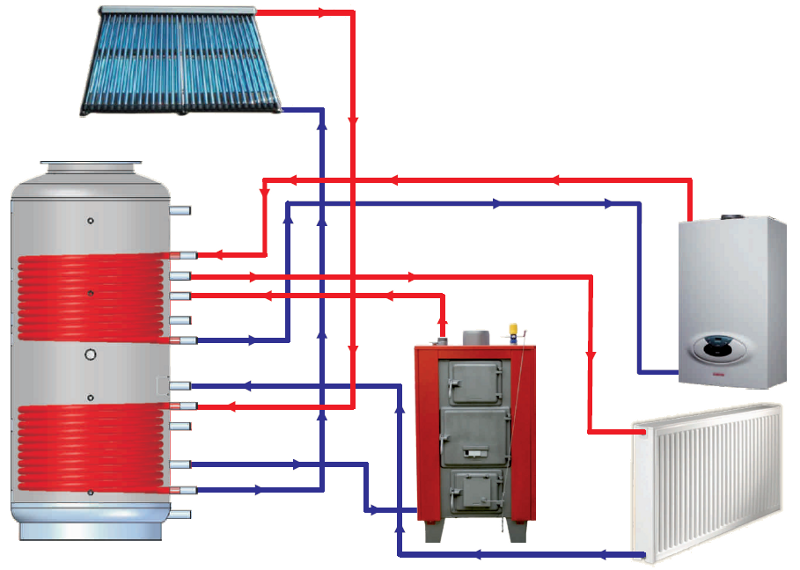 Below you can see some examples of heating appliances connected to a buffer tank. 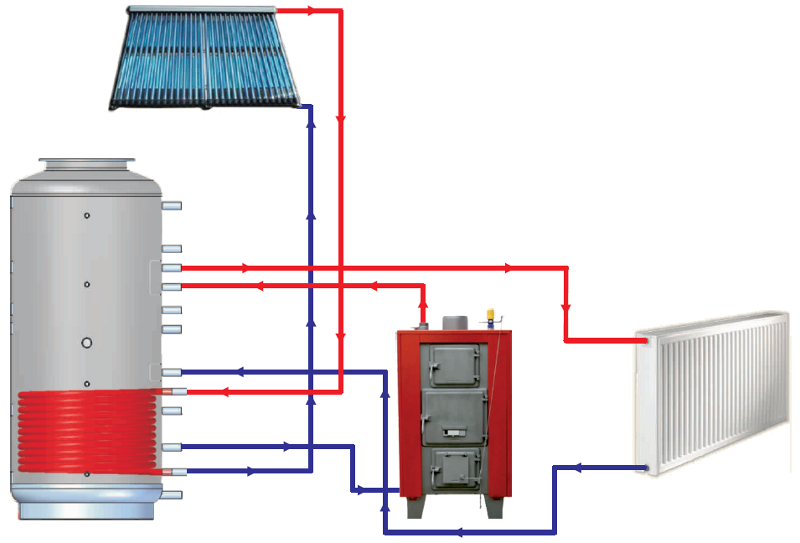 Heated water flows into a buffer tank from appliances (boiler, solar, stove, heating pump, etc.). Thanks to the spiral coil the water inside of buffer tank heats also domestic hot water. Therefore power rate of hot water flowing inside of the coil is dependent on heat-delivery surface, not on volume of the hot water. 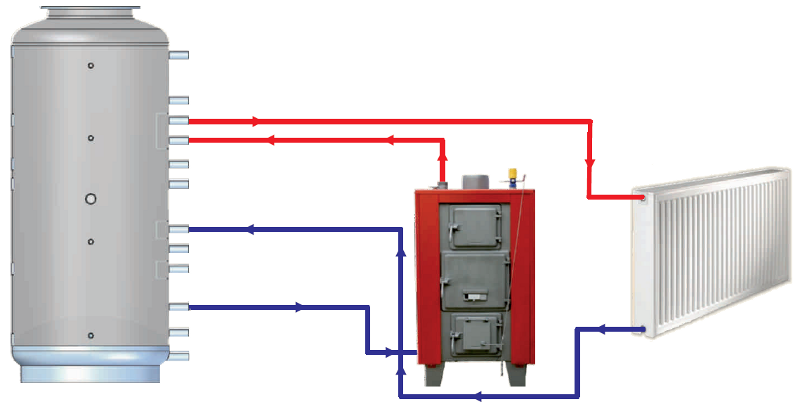 For hot water heating we recommend the LMT type buffer tank which can be equipped with up to two steel coils for indirect heating and one stainless steel coil for hot water. The LMT's stainless steel coil have finned surface for even better heat exchange between the heating water and hot water inside of the coil. 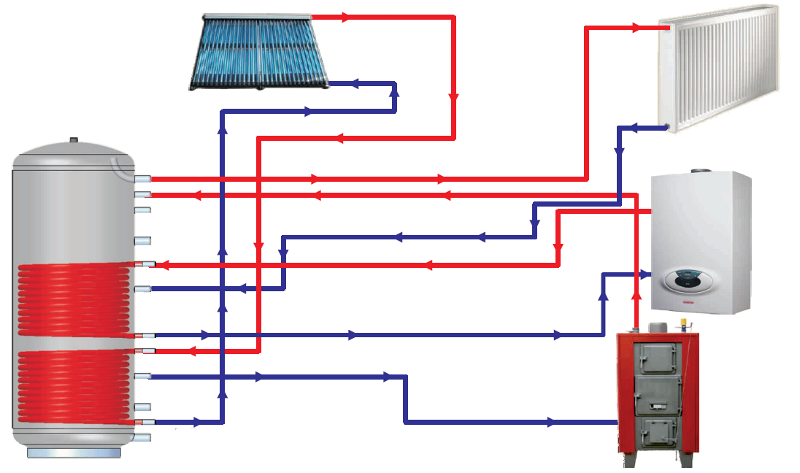 The 2V type have two steel coils for two separated heating systems and one steel coil for DHW. This way you can use also LMG, LVT or LSX buffer tanks.